Finding herbs and vegetables commonly used in Japanese cooking can be a challenge. If you do find them, they are likely to be expensive. One way around this problem is to start your own garden. 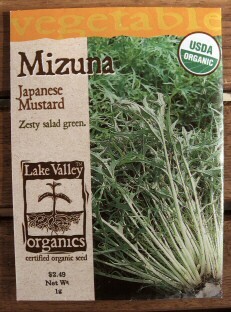 The other day I was at a local garden shop and found a pack of Organic Japanese Mizuna seeds. Mizuna is light, leafy mustard green. It has a mild peppery flavor. You can use it in salads and stir-fryâ€™s. Mizuna grows best during the cooler weather of early spring or fall. To harvest, just trim the plant down to about 1 inch height with a scissors.